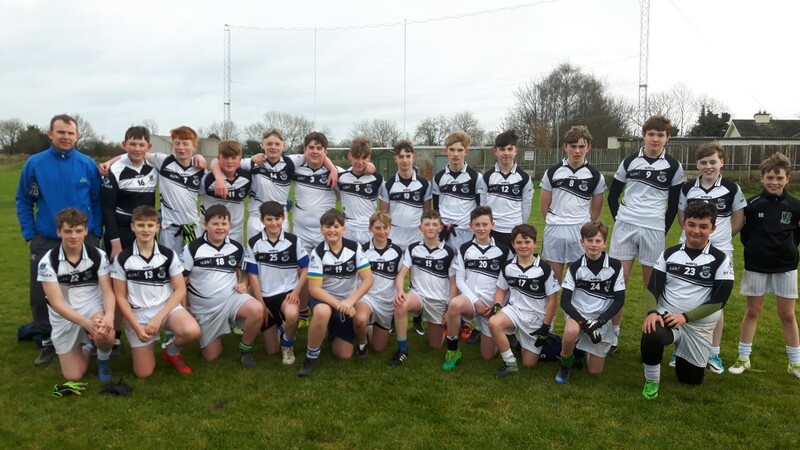 Our U 14 Gaelic Football team faced off against St. Farnan’s of Prosperous on Monday the 27th in Hawkfield in the final of the Kildare section, for the opportunity to progress to a North Leinster U 14 football semi-final. St. Paul’s got off to a super start and raced into a 1-3 to 0-0 score lead after 15 minutes. A couple of lapses in concentration gave St. Farnan’s a foothold in the game but we responded well with a couple of well taken goals and took a deserved 3-4 to 1-4 lead into the halftime break. We had the perfect start to the second half with an early goal but the rest of the second half proved to be extremely tight and close fought with scores hard to come by. With 5 minutes left we had a golden opportunity to wrap up the game but Eric Morrissey was denied by both the goalkeeper and the post! St. Farnan’s battled hard and scored another goal but it proved to only be a consolation as St. Paul’s deservedly held on to win by 6 points, on a scoreline of 4-7 to 2-7. The team can be proud of their efforts and a great result, even if a few lapses kept the scoreline possibly closer than it could have been. All players performed well and Josh Bannon, Kane O’Reilly, Eric Morrissey, Russell Grattan and Joseph Walsh were among those who particularly impressed. We now progress onto the North Leinster competition and await confirmation of our next fixture.